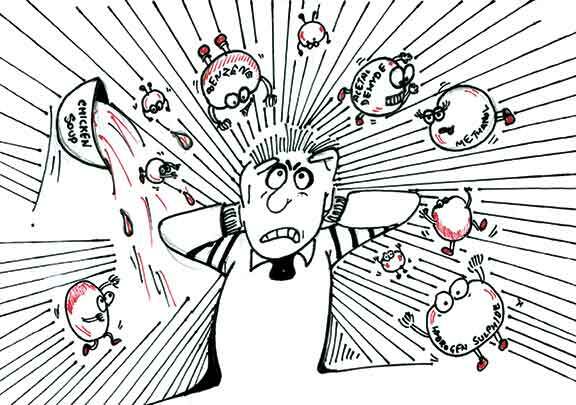 When I was alerted to a New York Times article featuring the headline “How Chemicals Affect Us,” I was pretty sure the columnist was not about to discuss how antibiotics cure infections, how preservatives protect us from eating moldy food or how detergents clean our clothes. I knew I’d be reading a litany of warnings about toxins, poisons, and endocrine disruptors. Unfortunately, that’s what the term “chemical” has come to mean. 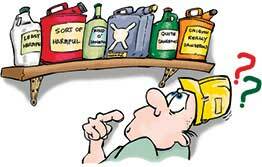 To many, chemicals are the substances that insidiously invade our lives and shorten them. The problem is that the human body is very complex, and its interaction with the environment is virtually impossible to totally clarify. We are exposed to a vast array of compounds, and how they interact with each other and with the naturally occurring compounds in our body, defies analysis. One can take virtually any single compound, carry out animal studies with varying doses, and find something that can be used to raise alarm. The bottom line is that nobody really “knows,” because the effects of trace chemicals cannot be teased out from the biological noise. This is especially the case for chemicals that mimic hormone activity. Is bisphenol A worse than soy? Do we stop drinking milk because it contains estrogens? Do we ban alfalfa sprouts because they contain coumestan, an estrogen mimic? A recent study by the Silent Spring Institute, a non-profit research organization, is a case in point. Researchers enlisted 20 people who volunteered to have the amount of bisphenol A and phthalates in their urine measured before and after a change in their diet. For three days they agreed to avoid all canned and packaged products and to build their diet around fresh, organic food. And guess what. After three days, bisphenol A levels and phthalate levels in the subjects’ urine decreased by roughly 65 and 55% respectively. Wow! Looks like one can decrease these “toxic” chemicals in our bodies dramatically after just three days by avoiding processed foods! Don’t get me wrong. I’m a big proponent of eating fresh, unprocessed foods, but more for the beneficial nutrients they contain than the “toxins” they eliminate. Remember, though, that chicken soup made with fresh vegetables and organic, free range chicken can still deluge the urine with plenty of compounds that could be vilified the same way as BPA or phthalates, if only one cared to make the effort. You put parsnips in your soup, don’t you? Well, they contain psoralens, compounds that are not destroyed by cooking and have carcinogenic potential. But I’m not worried about the psoralens. Or about storing my left over soup in plastic containers. Why not? Because I look at numbers. And those numbers tell me that whatever “toxins” may be present are there at levels way below what regulatory agencies find acceptable. I know how the scientists at Health Canada, FDA and EPA determine these levels. I know their qualifications and level of expertise. I also know the same for their critics. I know whom to trust. The author is director of McGill University’s Office for Science & Society (mcgill.ca/oss). He can be reached at joe.schwarcz@mcgill.ca. Chemistry is a fascinating subject to teach and learn! Here is an activity to help students understand that chemicals are present everywhere in our environment and that the effect of a chemical is related to its dose and concentration. Ask students to bring to class two items each – one with chemicals and one they think is without chemicals. Place the items on a table and ask the students to individually list all the items with chemicals, and all those without. Then ask them to share with you their choices and discuss with the students the concept of chemicals and terms like synthetic, natural, harmful, and toxic. From the discussion help students realize that synthetic chemicals can be “good” (medicines), naturally occurring substances can be harmful or toxic (carbon monoxide, hydrogen sulphide), and that all things are made of chemicals. Step 1: Using the eyedropper, add 2 drops of the chemical into beaker A; 4 drops into beaker B, and 16 drops into beaker C. Stir, till the water in the beakers are uniform in colour. Step 2: Point out to the students the difference. The water in beaker A has a pale colour, in beaker B a darker colour, and in beaker C, a deep colour. If the chemical was harmful to people which one of these three beakers would contain the least harmful solution? Is the quantity in beaker B enough to cause harm? How about in beaker C? If the chemical was good for you, which beaker would you pick? 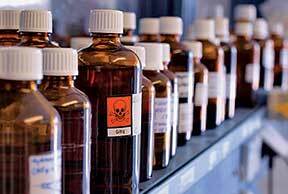 If the chemical was good for you when consumed in a small dose, and harmful otherwise, which beaker would you choose? Step 4: Take beaker D, add 16 drops of the chemical, and stir. Comparing the contents of beaker C and D, point out that while both beakers received the same dose (16 drops) of the chemical, in D the colour of the solution is deeper. • Ask the students which one they think would cause more harm if the chemical was harmful? • If the beaker was the human body – which body had a higher concentration of the chemical? Given the constant dose (16 drops), the beaker with lesser water would be more harmful, as it would have a higher concentration of the chemical. You could also point out that between beakers A, B, and C, C would have the highest concentration given that it has the most number of drops of the chemical in the same quantity (volume) of water. Step 5: From the above two instances, ask the students to come up with their own definitions of the terms “dose” and “concentration”. Also, explain the terms with relation to the human bodies. From the experiment, the students will understand that for people of different sizes, the same dose of the chemical results in a higher concentration in the person with a smaller size. For people of the same size, the one who ingests more of the chemical has a higher concentration of the chemical in his or her body. To demonstrate this better, students could administer different doses to seeds and compare the effects on the growth of plants.